Vedanta Resources plc is a global diversified metals and mining company headquartered in London. It is the largest mining and non-ferrous metals company in India and also has mining operations in Australia and Zambia. Its main products are copper, zinc, aluminium, lead and iron ore. It voluntarily delisted from the London Stock Exchange in October 2018, months after the massacre of 13 people who were protesting outside a copper smelting plant in Tamil Nadu, India in May 2018. The plant closed permanently days after the massacre – after two decades of protests by local people suffering health problems due to pollution from the plant. 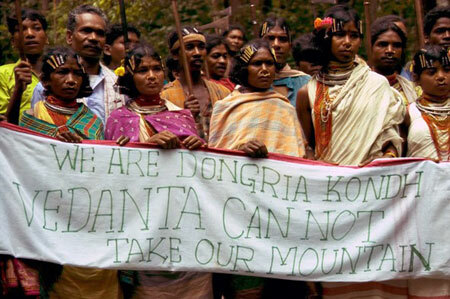 Vedanta has been criticised by human rights and activist groups, including Survival International, Amnesty International and Niyamgiri Surakshya Samiti, because of the company’s operations in Niyamgiri Hills in Orissa, India that are said to threaten the lives of the Dongria Kondh people who populate this region. The Niyamgiri hills are also an important wildlife habitat according to the Wildlife Institute of India as well as independent studies carried out by civil society groups. In September 2013 a referendum of the tribal peoples rejected Vedanta’s mining plans. Vedanta’s BALCO subsidiary was responsible for the deaths of at least 42 workers when a chimney collapsed in 2009 at its Korba complex in Chhattisgarh. Because of multiple levels of subcontracting, and because the company bulldozed the site shortly after the disaster, the exact number of deaths and the identity of the dead workers remain unconfirmed. Foil Vedanta: a UK grassroots group campaigning against Vedanta.